Posted: Thursday, January 14, 2016. 2:09 pm CST. 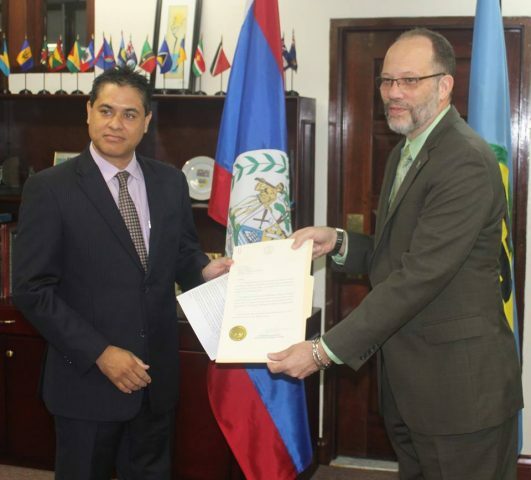 By Aaron Humes: Belize has a new ambassador to the Caribbean Community or CARICOM. He is His Excellency Daniel Gutierrez, most recently communications officer for Belize Natural Energy. At his accreditation ceremony today, he said that the best years of the integration movement lie ahead for what he calls the “tremendous untapped potential” that lies within the Region. 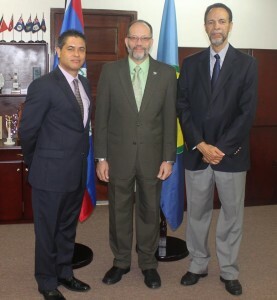 Speaking at a ceremony to present his letters of credence to CARICOM Secretary-General Ambassador Irwin LaRocque, at the CARICOM Secretariat Headquarters today, Gutierrez referenced Prime Minister Dean Barrow’s New Year Address in which he heralded 2016 as a landmark year for the integration movement. Prime Minister Barrow is currently chairman of CARICOM. “But as leaders and servants we are obligated to diagnose, understand and engineer solutions that will guide our people to resilience in the troubling waters ahead. The skies ahead darken with climate change, economic uncertainty, a haunting gap in education and technology with our global competitors and any number of parallel global challenges. Undaunted we shall remain.” End quote. He added that the hard work which identified hurdles and proposed a Strategic Plan for the Community must be matched by action. Belize is to host the regional inter-sessional heads of Government meeting later this year.